Bronze, smooth patina, dark brown, solid cast. Imperial period. Height 12 cm. Saint Petersburg, The State Hermitage MuseumInv. No. Б. 290 (St. 611). Inv. No. Б. 290 (St. 611). Unknown; from the Laval collection, acquired in 1852. “And thou, son of Cronos and Rhea, who hast thy home on Olympus, on the peak that overlooks the games and on the bank of the Alpheios…” (Pindar, Olympic Ode II). 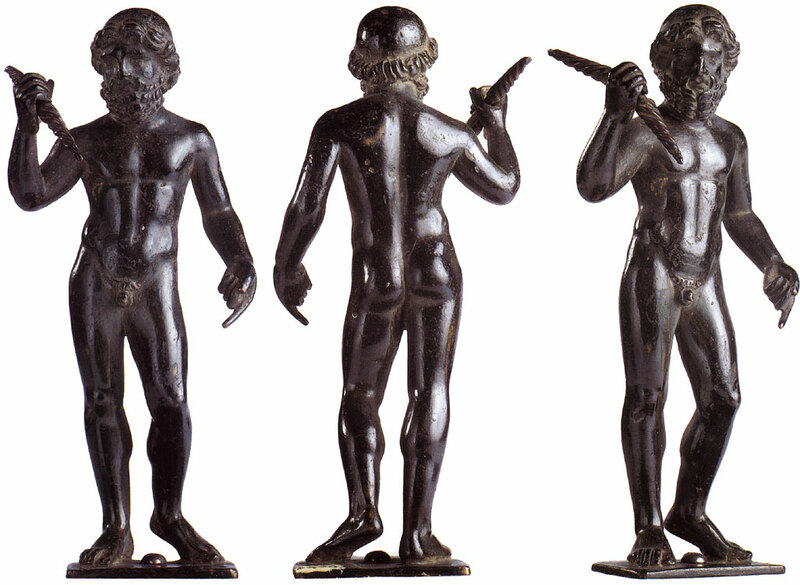 Zeus is naked, standing, his left leg in motion, relaxed from the knee down. The bodyweight is resting on the right leg. In his raised right hand, he is holding a spear, symbol of the sovereign power of the supreme god. Heavy and opulent hair, parted from side to side, frames the face, while on the head it forms a flat “cap”. The beard is carefully trimmed around the broad and powerful chin. The flexing of the hips and musculature is accentuated very discreetly. Zeus is represented in a static pose, not in action, as in the many statues which exist of “Zeus casting a thunderbolt”. The statuette is of a good quality. Unpublished, mentioned by Stéphani, Drevnije bronze i terrakotte (St. Petersburg, 1872) no. 611 p. 24. © 1993. Photo, text: Olympism in antiquity. Olympic Museum Lausanne. Bertelsmann UFA. Industria Gráfica S. A. Barcelona, 1993, p. 66 cat. no. 9. © Photographic credits — M. Verhasselt (Brussels-Dilbeek). © 1993 — Comité International Olympique.